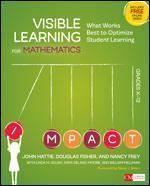 Welcome to the Visible Learning for Mathematics Book Study! Hopefully, you had an opportunity to join us at a Dine & Discuss. If not, that's okay, too. To participate in the online forum, you must be a member of ATOMIM. But no worries- because our membership is now free! Just sign up on the link. Our rules here are simple: Keep it professional and respectful. Take a moment to read through others' comments. Use the reply option if you have a question or comment on someone else's post. We can make this an interactive space - an ongoing conversation - and get the most out of our learning together. Following is the schedule for our Book Study this year. It will end prior the Spring Conference April 5 & 6, where we hope to celebrate our learning together. Consider the framework for differentiated instruction discussed in this chapter. 1. Thinking back over the recent units of study you have taught, what forms of differentiation do you use most often? 2. Which forms would your students benefit from your using more often? 3. How can you accomplish this? Think about the strategies you use to help learners make connections in their learning. What is the mix of near and far transfer opportunities (describe on page 177 & 178) you provide your students? How do you think about introducing/scaffolding these opportunities for learners? 1. What are your favorite or most powerful problem-based tasks for learners? 2. Are you using them for maximum transfer impact? 3. How could you refine your implementation of these tasks to make learning most visible? Consider the grouping practices in your classroom. What strategies do you use to form mixed-ability groups and to ensure both group and individual accountability? What new ideas from this chapter could you use to ensure more rich and rigorous collaborative work in your mathematics classroom? 1. How are manipulatives used in your mathematics instruction? 2. Mathematical practice 5 calls for students to use appropriate tools strategically. How do you allow students to make decisions about the tools they use in their work? 3. How are these tools used to move learning from surface learning to deep learning? Consider the strategies you use, and the strategies you've read about and tried from this chapter to solidify surface learning. What are some effective ways to build surface learning, and why is that necessary? 2. In what ways are they used for multiple representations as students work on mathematics collaboratively? 3. What strategies can you use to make these tools more available to your students? Identify two or three mathematics tasks you've asked your students to work on recently. Think about each task in light of its difficulty and complexity (see Figure 3.1 on page 77). In which quadrant does each task fit? Is each the right kind of task given your learning intentions? Make notes of the questions you typically ask in your math lessons. Think about them in terms of the focusing and funneling questions framework discussed in this chapter. 1. Which way does your questioning sequence lean? 2. How can you make focusing questions a stronger presence in your mathematics classroom? Learning intentions can help students make connections between current learning and previously learned content. Identify the learning intention for a lesson you have recently taught. What previously learned content is connected to this learning intention? Did your students see the connection? If so, how did this impact thier engagement in the learning? If not, how might you modify the learning intention and experience to bring more attention to this connection? ATOMIM is an affiliate of the National Council of Teachers of Mathematics, National Council of Supervisors of Mathematics and of the Association of Teachers of Mathematics in New England.